Here is a very simple, cheap and yummy dish to make. Something called “Tapas spice” with chili, that cost me next to nothing a few months ago. Again, just a leftover thing, I was almost out of it, so I just used the last bit. -My very favorite thing to add to this dish is rosemary or thyme. But I didn’t have any today. If you have either, you should try it. 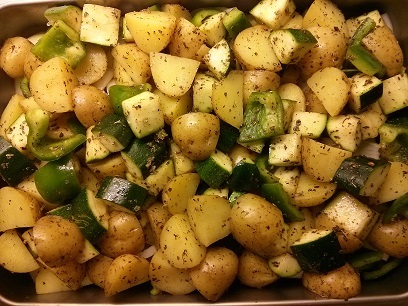 Cut the potatoes into bite size. Boil them for 3 minutes. Boiling them prevents them from drying up when you bake them. I always do this and I think it makes a big difference. Cut everything else into bite size. Cover the bottom with onion chunks. When the potatoes have boiled for 3 minutes, drain the water from the potatoes and put them in a mixing bowl with the other vegetables. Drizzle a bit of cooking oil and toss everything around in the mixing bowl. Add all the spices and toss again. *Put into baking tray and bake at 225 C for around 40 minutes. Keep an eye on it after 30 minutes. 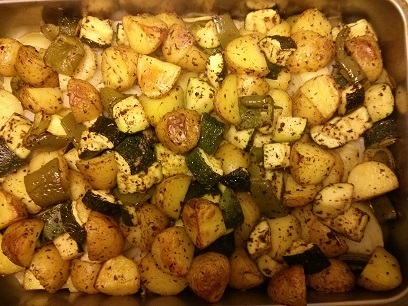 The dish is done when the potatoes are completely cooked. *I don’t preheat the oven in this case, since I think it is a waste of electricity and it doesn’t ruin the dish, to get it cooking before the oven is hot. I never do this with bread or cake though.